Valerie Sampson sent this picture. This photo was taken this past summer in Jefferson City, Tenn, where my son Jacob was attending a "Music Is Cool" camp with the Cadets. This camp is an awesome way for high school musicians to experience a day in the life of a drum corps. My son had an awesome time and will never forget this experience. He is the one in the red shirt. He is now in the process of auditioning for Memphis Sound. 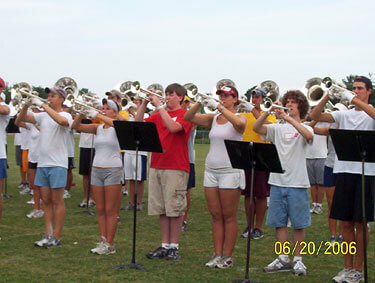 I think it is safe to say that this one day with the Cadets sealed the deal in his desire to march in a drum corps.